While not the full out bans being pursued in Utah and Washington, Democrats in Iowa are working hard to have retail restrictions to be placed on dissolvable tobacco products. This is still a flavor motivated action as indicated on the Iowa Senate Democrats page. This is really quite the “wonderful” article; more misinformation per sentence than can usually be found, and worth addressing paragraph by paragraph. However to fully make sense of some of this document it might be useful to present some of the expert input they relied on to get the real background on the issue. 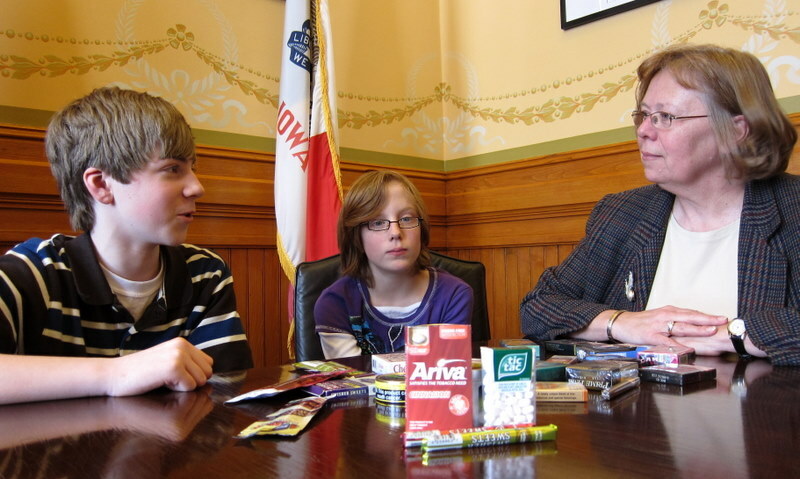 Senator Mary Jo Wilhlem meets with Asa Shorkey and Claire Meyer, two children concerned about candy lookalikes that are loaded with nicotine. I don’t see any of that tasty fruity, mint or cinnamon Nicorette on the table nor do I see flavored Viagra (orange, pineapple, banana, orange, or strawberry) but they could be behind the tic tacs. Also notice that these children are concerned about products they have no legal access to. Perhaps the good senator did not explain to the children that thanks to existing laws they would never come face to face with these products unless they circumvented those laws. Which raised the question of whether we may in fact have evidence of a crime in progress: flouting the laws she herself has sworn to uphold, the senator is exposing minors to products they otherwise not gain access to. Did you know that there are new nicotine products being sold here in Iowa that look like candy, smell like candy and taste like candy? This is more of that usual nonsense implying that us adults do not want things we put into our mouths to taste good. I, for one, prefer a richly flavored and natty looking dissolvable tobacco lozenge to a bland gray pill, and tobacco companies know this. They need to attract adults to their product if they hope to make a go at it. But these Democrats must be visitors from another planet where children and adults are members of separate species with differing ideas of what tastes good. But the anti-candy flavor argument which have no truck with anyone who possesses taste buds somehow tends to carry the day. These nicotine-spiked products come in strawberry, banana and grape flavors to appeal to kids. Eating multiple tablets could cause vomiting, seizures or death. Nicotine-spiked are they? This implies that these were originally candy products that were then “poisoned” rather than nicotine products that were then flavored. So with flavor now established as sufficiently evil, let’s turn it up a notch and throw in the risk, nay the certainty, of poisoning. Kids will be attracted to these and they will die. This particular unfounded panic, like the unfounded 3rd hand smoke panic, can be traced back to Pediatrics Journal (like Cassandra a doom sayer, but unlike Cassandra, believed more often than not). Even before these new products came on the market, tobacco poisoning was a problem. Between 2006 and 2008, the nation’s poison control centers received more than 13,000 reports about the ingestion of tobacco products by children under 6, according to a study that appeared in the journal Pediatrics in 2010. Nicotine products are associated with some fatalities, but it might interest you to know that since 2004 there has not been a single death associated with nicotine or tobacco, and in 2003 the one related death was from ingesting a pharmaceutical nicotine product (see the AAPCC reports here). In fact, the focus on smokeless products is rather odd considering how rare it is that children will ingest them. The just over 300 events a year are about half the number of people that are struck by lightning each year. Of course the lightning has more severe consequences with about a 10% fatality rate. In general children prefer plain old cigarettes, eating them at about ten times the rate they do smokeless products. (The cigarettes are not flavoured so one could argue that the flavourings of smokeless products might actually make them less appealing to children given the distribution of events). To be fair, cigarettes are far more common than smokeless products and thus more likely to be found around the house. (Kids end up poisoning themselves more with quite a wide range of non-candy flavored products). With tobacco companies finding new ways to target our kids, Senate File 154 would limit the sale of dissolvable tobacco to tobacco stores where children are not permitted. On first consideration, the action itself does not sound unreasonable. What could be bad about limiting the sale of these tobacco products to tobacco retail outlets? Nothing at all. Except, as far as I can tell, this rule does not apply to cigarettes or any other tobacco products. So what you have is a regulation that will limit the purchase of safer alternatives to just a few locations which you can interpret either as an impediment to people trying to use safer forms of nicotine or as protecting cigarette sales. It certainly has no effect on children’s access since they are not allowed to purchase them anywhere. The aggressive marketing we’re seeing from big tobacco companies underscores the need to protect Iowa’s successful tobacco-prevention and cessation efforts, including JEL (Just Eliminate Lies) and Quitline Iowa. It seems a real concern is that the possible success of these alternative products could put the tobacco control programs at risk. And they could. In contrast to the expensive and ineffective tobacco control programs all they have to do is leave this on the market, make sure it is at least as available as cigarettes, and tell people the truth rather than continue with the lying that not only ignores the science but eats up tax dollars. But it does not need to be seen as competition. Though JEL doesn’t add much to the debate other than more misinformation mixed with the news everyone already is quite aware of, for some smokers who are trying to quit, quitlines can be of use, just like the option of switching to safer smokeless nicotine products. If the cause is to get people off smoking, to reduce smoking related disease, then quit lines and dissolvable tobacco products both work toward that end. A false dichotomy is being promoted. In summary, what is happening in Iowa appears to be part of a concerted effort to remove new low risk alternatives from the marketplace, resulting in fewer options for health minded smokers. Whether this is a clever means to protect the lucrative pharmaceutical market or just sheer anti-tobacco ignorance, it is an insult to everyone concerned to use the bodies (and opinions) of children to infantilize the debate. The kids are already well protected but it seems smokers are unworthy of any consideration at all. It is really sickening that big Pharma is willing to use children to promote the deceptive practices they employ in trying to keep a safer alternative off the market. This was used in Boston to great success well before I had even heard of ecigs or snus! They had kids under 16 claiming to be afraid someone in their families might try a flavored paper. Keep in mind these alleged family members weren’t using the products but they might if it had flavoring in the papers. Flavored papers are typically used by pot smokers which they never mentioned but it was successful in shutting down cigar stores which I frequented as a safer way to use tobacco at the time. I hadn’t known about ecigs then but figured it was less risky than my cigarette smoke inhaling. It is simply shameful that those in the senate and government in general would continue lying to their constituents to keep cigarettes on the market instead of any safer alternative. They should be jailed and forced to use the health care they force on us. Somebody arrest that senator for deliberately exposing those “poor children” to dangerous tic tacs and those safer nicotine alternatives. No matter of course “the poor children” ordinarily have no access to these items except for the senator’s placing said products in front of them lol. What a bunch of total morons! Truly unbelievable what new nonsense they can create and spew to get around telling the truth about safer smoking alternatives. I used to think Al Franken was a decent intelligent man evidently I was way off base! Most children do not have access to cigarettes nor do they have the desire to smoke unless it is introduced by a friend or family member. I am not sure what this Senator is trying to gain, but there has to be a hidden agenda.